Private collection, United States; sale, Christie's, New York, 13 May 1980, lot 92. Private collection (acquired at the above sale). Anon. sale, Sotheby's, New York, 12 May 1987, lot 410. G. Bloch, Pablo Picasso: Catalogue de l'oeuvre gravé céramique, 1949-1971, Bern, 1972, vol. III, pp. 59, 62, 69, 76, 80-81, 83-84, 86-88, 91, 93-94, 96-97, 102, 104, 108, nos. 63, 68, 82, 90, 94, 95, 97-98, 100-102, 105, 107-108, 110, 111, 116, 118, 122 (white earthenware versions illustrated). D. Cooper, F. Hugo and P. Hugo, Picasso: 19 plats en argent, Paris, 1977 (other examples illustrated). A. Ramié, Picasso: Catalogue of the Edited Ceramic Works, 1947-1971, Madoura, 1988, pp. 145, 158, 164-168, 170-174, 176, 178-179, 184, 186-187, nos. 283, 309, 321-323, 326-327, 329, 332, 334, 336, 338, 340, 343, 347, 349, 358, 361, 363 (white earthenware versions illustrated). P. Hugo and C. Siaud, Bijoux d'artistes: Hommage à François Hugo, Aix-en-Provence, 2001, pp. 147-193, nos. 1398, 1403, 1406-1413, 1424-1428, 1434, 1438-1440 (other examples illustrated in color). In August 1946, while on holiday with Françoise Gilot at Golfe-Juan, Picasso visited an exhibition of local crafts at Vallauris, a nearby industrial hamlet. The ceramics from the Madoura pottery works in town caught his eye, and he asked Georges and Suzanne Ramié, who owned and operated the atelier, for the opportunity to try his hand at the medium. So began, quite by chance, Picasso's enduring love affair with ceramics and his legendary collaboration with the Ramiés, which lasted for more than two decades. The artist made his first hand-decorated ceramics that very day in 1946 and began working intensively at the Madoura pottery the following year, producing work of a dazzling variety. In May 1948, he settled with Françoise and their young son Claude in a modest home at Vallauris known as La Galloise; the next spring, he acquired a sprawling former perfume factory, Le Fournas, and transformed its ramshackle workshops into expansive studios for painting and sculpture, as well as storage space for his burgeoning ceramic output. "Making sculpture and ceramics was not, as is sometimes implied, a 'diversion' for Picasso from the more 'serious' business of painting," Elizabeth Cowling has written. "His vision of the world quite as much as his restless powers of invention found full expression in both activities" (Picasso: The Mediterranean Years, 1945-1962, exh. cat., Gagosian Gallery, London, 2010, p. 315). By 1956, Picasso had been making ceramics for a full decade, and his collaboration with the Ramiés was going strong. His relationship with Françoise had ended three years earlier, and he had taken up with Jacqueline Roque, who had recently come to work for the Ramiés; she would become the last great love of his life and the principal muse of his final two decades. Picasso moved out of La Galloise in 1954 and the following year settled with Jacqueline at La Californie, an ornate, late nineteenth-century villa overlooking the Mediterranean coast at Cannes, just five miles away from the Madoura pottery. Whereas La Galloise had been too small to accommodate Picasso's prodigious output, La Californie offered ample space for both living and work, and its numerous Art Nouveau features lent the house a vaguely Orientalist air that attracted the artist. Moreover, the new home was adequately secluded, now an all-important concern for Picasso, whose fame attracted ever-growing numbers of admirers who threatened to disrupt his rigorous daily work routine. The present group of nineteen silver plates has its genesis in a visit that the art historian Douglas Cooper made to La Californie in late May 1956. Picasso and Cooper were examining a group of ceramic platters that the artist had recently created, which had just been delivered from the pottery, and Picasso remarked how splendid they would look in silver, like opulently chased, precious metal dishes of the sixteenth and seventeenth century. The artist lamented not knowing anyone who could undertake the project, and Cooper proposed that he enlist the assistance of silversmiths François and Pierre Hugo. "At once Picasso's interest was aroused," Cooper later recalled (op. cit., 1977). In September 1956, Hugo agreed to execute in silver nineteen decorated plates that Picasso would provide to him in biscuit (pottery that has been fired but not yet glazed). "These platters are not posthumous 'inventions' decorated with motifs culled from a variety of authentic works by Picasso," Cooper has explained. "Each one was individually selected, designed, seen, approved and cherished by Picasso himself during his lifetime" (ibid.). When Picasso ordered the first plates from Hugo, he apparently intended to keep them for himself and had not yet thought of commissioning additional sets for sale. "Thus, at the start, their existence was wrapped in secrecy. Picasso repeatedly refused to loan any of them to an exhibition, and although he was full of admiration for the results achieved and delighted in contemplating these platters, he concealed them from view when visitors were around as though they constituted some private treasure" (ibid.). 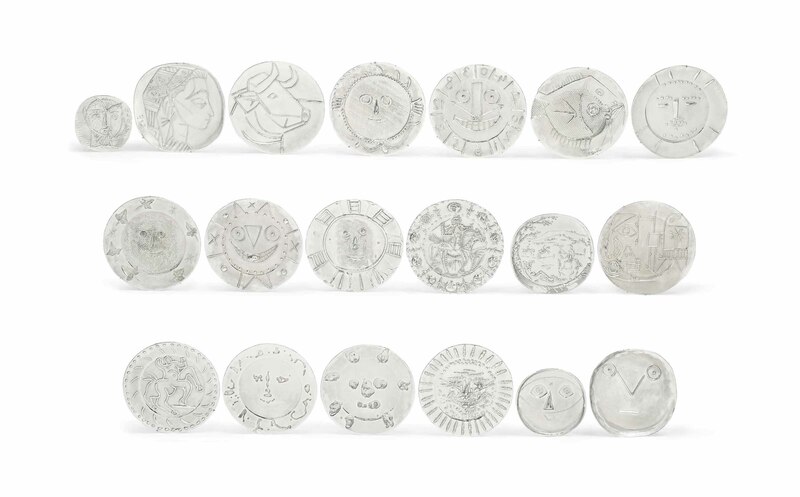 In 1967, Picasso finally authorized Hugo to produce twenty numbered sets of the plates for sale, along with four artist's proofs; many of the sets have subsequently been dispersed, but the present group is distinctive in being offered intact.